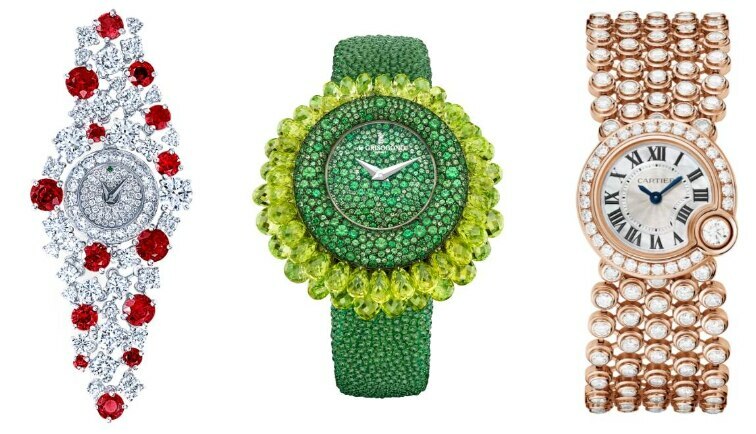 Scroll down for some beautifully embellished timepieces that will not only serve as an elegant touch to your bridal look but can also be donned for special occasions post wedding for that extra touch of glamour. An exquisite watch featuring a slender bracelet set with brilliant-cut diamonds and rubies to evoke a star-studded galaxy, this is no doubt one of the best timepieces to don with your engagement party attire. This sculptural cuff watch is fully encrusted with sparkling sapphires masterfully set on an 18-k white gold frame. And the futuristic spikes set in varying hues of gem blue, echo the glacial waters of Audemars Piguet’s home in the Vallée de Joux. Isn’t that amazing? Highlighted by cascading spinels and diamonds paved Art-Deco patterns, the Joy de Lumière creation sparks like a crystal-clear night. It is lavishly embellished with precious stones and diamonds that the Maison Boucheron reinterprets with a contemporary twist. You can also wear this timepiece when out for a post-wedding dinner date. The Piaget Limelight Gala Watch G0A38168 is cased in 18-k white gold set with 68 baguette-cut diamonds and is just the piece you’ll want to wear with your elegant reception outfit. Jaw-dropping is the word! Set in a white gold case and with emeralds and briolette-cut emeralds – quartz, this awe-inspiring timepiece will be an ideal option to don with your floral wedding ensemble. The Désir de la Reine wristwatch in 18-k white gold with a bow motif, set with two pear-cut diamonds and brilliant-cut diamonds, is a stunning watch that can also be worn post-wedding for brunches with the girl squad. With a bracelet in 18-k pink gold, set with brilliant-cut diamonds, the Blanc de Cartier Watch offers a feminine look, which is sure to complement your traditional-yet-modern wedding look. The Mini Twist by Harry Winston timepiece is inspired by Shinde’s majestic design legacy and includes a timepiece featuring marquise and brilliant-cut diamonds, set in twisted gold cables to form a fluid-like, intertwined jewellery creation. This is the cutest arm-candy out there. Generous curves adorned with a dazzling array of diamonds make this L'Heure du Diamant self-winding mechanical watch worth the buy. With 18-k rose gold and diamonds, this is a luxuriously feminine timepiece. Planning to ditch the usual bangle on your wedding day and try something new? Opt for this beautiful timepiece, hand-engraved with yellow gold, set with diamonds and a mother-of-pearl base dial, and make heads turn.